If you ever asked my mum about my hair/me she would most likely roll her eyes at you and say 'don't even ask'. One minute I want long princess hair and the next minute I get mad and want a bob. One week I want to spend time curling or straightening it and the next I just want it shoved up in a messy pony tail, grease and all. 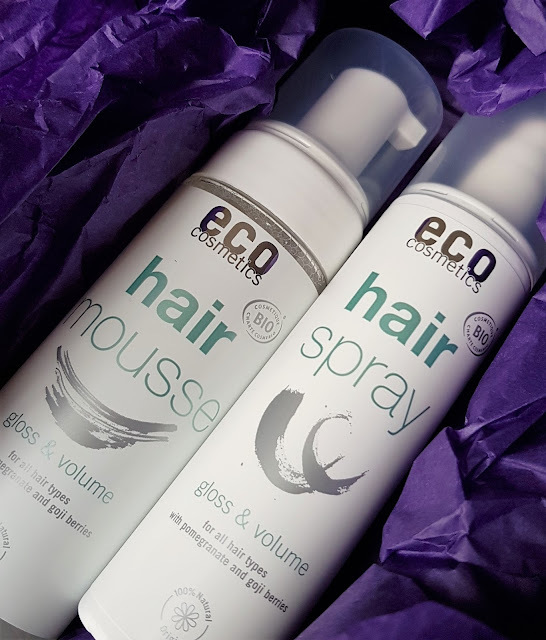 That being said, recently the lovely people at Eco Cosmetics have sent me a couple of hair products to up my hair game and now I'm going to put them to the test. To give these a fair test I started by washing my hair as usual. For anyone wondering I literally just use the Alberto Balsam Tea Tree Tingle Shampoo as, quite simply, it's cheap and is about the only thing that doesn't make my hair greasy. When I use this it means I can go every other day between washing my hair which is much healthier. Now my hair is all fresh and towel dried, let's look at the products! The first thing I noticed about this was how amazing it smells. Full of natural and organic products, this non-sticky mousse has a delicious fruity smell (pomegranate and goji berries to be exact). The product promises to make styling easy and leave your hair feeling soft, shiny, silky smooth and frizz free. I applied the mousse to towel dried hair and then brushed it through to make sure it was evenly distributed. As mentioned it wasn't sticky at all and left my hair smelling so nice! I decided to leave my hair to air dry but I do know that using a hairdryer and a big brush would have been a great way to add extra volume. Next up, styling! 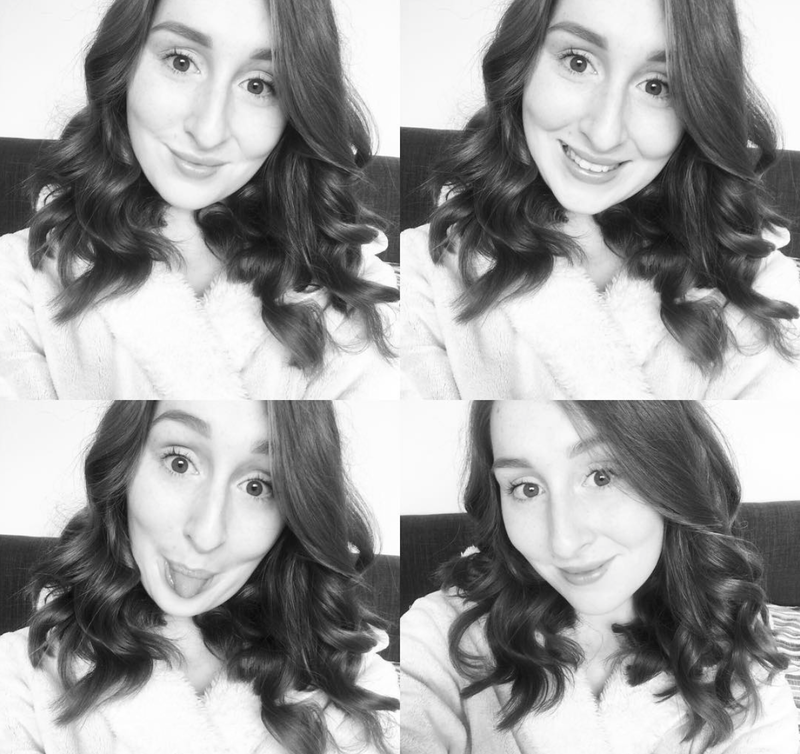 As usual, I used my GHD's to create some bouncy curls which is how I find easiest. I also thought this would be a great way to test the hair spray! The most interesting thing about this? It's not actually an aerosol! The spray promises a perfect hold without the hair feeling heavy, or sticky. Honestly, this fruity spray is so lightweight and as it's a 'water spray' it doesn't leave a crispy feeling to the hair. Once I had finished styling my hair I gave it a quick spritz all over, as well as the yummy smell I noticed the spray added an amazing shine. The best thing? Curls that lasted! A definite win-win from me! So, overall I would definitely give these products a thumbs up. Should you be after an organic alternative for haircare - something vegan even. Then I wouldn't look any further. Now, my question to you is, what are you favourite haircare products? Have you ever tried Eco Cosmetics? Disclaimer: This blog post is in no way sponsored however, the items shown have been kindly gifted to me for the purpose of this post. All opinions and photographs are my own.